If you’re not a fan of Mike Judge (films), than you might want to get your humour fix elsewhere because this film is as quirky as they come. Like his other films, Judge has successfully gathered an eclectic cast that not only verges on insanity but also brilliance. The film revolves around protagonist Joel (Jason Bateman) who is the successful owner of a small business which of course… makes extracts. However Joel’s life is far from idyllic and to sum it up in one word, it’s boring. That’s right, Joel’s life couldn’t get any worse and to compliment his boring life, he has to deal with boring people at work, in his neighbourhood and don’t get him started on his wife. His wife Suzie (Kristen Wiig) however is not boring but she doesn’t help spice up his life either and when she has her track pants on, her womanhood is tightly locked away. To make matters worse, besides a sometimes untouchable wife, he has an idiot for a neighbour (David Koechner) and a best friend called Dean (Ben Affleck) who always gives him the wrong advice which is where Cindy comes into the picture. Cindy (Mila Kunis) is the new employee at work and in order to appease his guilt, he hires Brad (Dustin Miligan), a male prostitute to seduce his wife in order for him to enjoy his carnal desires with Cindy… or so he hopes but unfortunately Cindy is a sociopath. 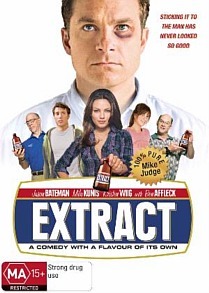 As you can see, Extract is far from boring and the star of this film is Bateman who plays the downtrodden Joel, a man with a predestined life who flips Fate the bird and tries to take matters into his own hand which if you’ve seen other films by Judge, generally backfires in some extremely entertaining ways. Consider Extract the thinking man’s comedy! The video and audio quality is acceptable, although don’t expect any standout moments. There is some grain as per DVD but overall, the images are sharp with vibrant colours. The Dolby Digital 5.1 track is a little muted but considering that this is a comedy, it should pose new threats to enjoyment. In conclusion, Extract is a very interesting and surreal comedy about one’s man boring journey as he attempts justification. It’s almost like watching a mouse in a maze, recommended!